If you received a postcard in the mail regarding the season pass sale, this entry is for you. The label on your postcard was supposed to include your customer ID number. Our website will ask for this when you order. The mail company we used had an oops! and forgot to include this number. After the initial panic wore off, the solution is this: a white postcard will be sent out tomorrow with your customer ID on the label. Please look for this in the mail! Sorry for the confusion and complication. Please call us if you do not receive your customer ID. Again, this is for those who have purchased a season pass in the last 3 years. Is mowing the lawn one of your least favorite chores? Well imagine having to mow an entire mountain! Our mowing operations began this week. Why, do you ask, would you want to mow a whole ski area? Well we take croquet pretty seriously around here and a nice lawn is key to a good game. 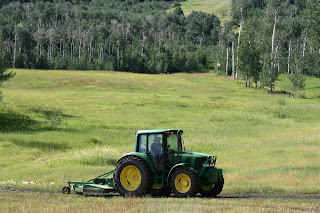 Ok actually we mow the ski runs so that it takes less snow to cover the slopes and start building a base. First priority is to get the entire disc golf course mowed. Imagine driving that thing up Wonderbump! Thanks to everyone who came up this weekend and checked out the new disc golf course! 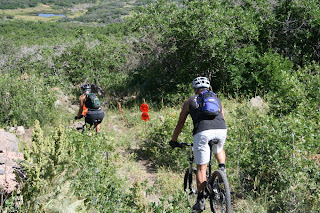 Tons of you had good things to say about the course. We always appreciate feedback, both postivie and negative. Course signage and maps are getting wrapped up this week. We will also be mowing the entire course. We attempted to get this done by last weekend but the mower broke and a part had to be replaced. The Alpine Trader is stocking discs and other items. Don't forget to stop in for gatorade and a snack for the course. And if you play on the weekends, the Wildewood Restaurant is open so you can fill up after your round. Lastly, look for details soon on Powderhorn's first disc golf tournament! I'm sure there's more going on, but just typing this list got me stressed out! Wondering what happened to the webcam? Well it's a little sick right now. It's stuck on a shot from this morning. Actually it's picketing against us. It's decided that it will no longer work under such poor conditions and is in talks with its union. We'll try to resolve the issue as soon as possible. On the bright side, we don't have to worry about getting caught with our finger in our nose while walking in & out of the office. I came back from vacation and (ta da!) we have a disc golf course! It looks incredible. We've added some pictures to the slideshow below so check it out. Better yet, come up and check it out for yourself! Our season pass postcards were printed while I was gone and you should be getting those in your mailbox end of next week. The pass sale starts August 1st! We've also made the decision to run the lift 2 days for Color Weekend this year (instead of just Color Sunday). That is scheduled for Sept. 22-23. And we have selected a winner in our sticker contest. Congratulations to Jeremy Cooper for this design. He has won 2 lift tickets for the 07-08 season. The Daily Sentinel misquoted Pete Wade on the cost of Disc Golf at Powderhorn- it is free to everyone. We just want you to come and enjoy our beautiful mountain! When you do come to play, be prepared. "The rough is rough", said Pete Wade as he climbed out of the trees. "Bring a mountain bag." (In that bag I would recommend...BUG SPRAY!) But Pete, Nick and Brian couldn't get over the views and the weather - played through a light rain and sunshine. The Alpine Trader will be selling discs for those of you who forget yours or tend to overshoot the holes. We don't have pads for throwing yet, and are working on maps, but it is sooo close! We'll see you up here soon! I wish I was there to see this! If you are planning on visiting the mesa for the 4th, please keep in mind there are fire restrictions! The Forest Service has fire danger for the Grand Mesa at Very High. Please respect this and keep our forests safe. Half of our disc golf baskets have already arrived! Construction of the course will begin after the holiday. The course has already been designed and laid out by local disc golfer Pete Wade. 07-08 passes go on sale August 1st. Buying a pass in August actually makes it quite a bit cheaper than last year. If you've had a pass in the last couple years, you should be getting a reminder in the mail in a few weeks. Go here to check out pricing and benefits. 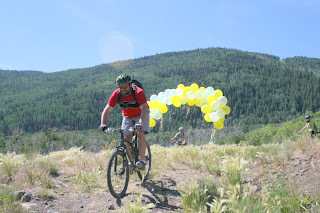 The Red Rock Racers will be having their next race this Sunday, the 8th. It's free to watch and beginners-experts are welcome to compete. Check out their site here. I'm taking off this afternoon for almost 2 weeks of vacation time. I'll load up the blog later today with some things to check out while I'm gone. Hopefully I'll find someone around here that's willing to update this thing for me. Have a great 4th!